For many parents, returning to work after the birth of a baby is an inevitability. However, there are particular challenges that specifically come along with being a working new mom. While each person’s financial and employment situation is different, it is vital that we all are aware of the rights that we have as working new moms. You may or may not be the type to rock the boat, but without at least knowing what is and is not required by your employer, you can’t make an informed decision on whether or not the boat needs a bit of tipping. 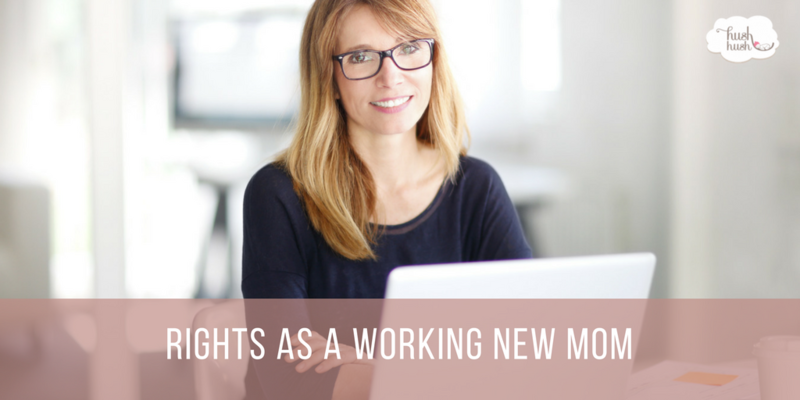 Below you can find some information on places to look to better understand your rights as a working new mom. The Fair Labor Standards Act (FLSA) of 1938 was amended in 2010 by the Affordable Care Act to include some special considerations for women who are breastfeeding. According to the Department of Labor, employers must now provide a nursing mother with reasonable break time to pump milk for one year after the birth of a child. However, there are currently no federal laws that mandate compensation for the time spent expressing milk which may mean a longer work day for you. Additionally, you have a right to the same benefits of other employees no matter how your pregnancy, childbirth, or related medical conditions may have affected you. Similar to the federal laws and legislation, many states have specific laws regarding the treatment of mothers who return to work. While it is not possible to give a comprehensive list of the various laws from state to state, they are typically not hard to find with a little bit searching on the internet. There may also be county or city requirements for businesses to provide certain concessions to working mothers, so it is worth looking into the laws where you live. Also, keep in mind that company policy may be subject to the laws of the state that the business is headquartered and those establishing company policy may not be aware of the laws where you work. As a result of the possible lack of knowledge of local laws, it is worthwhile to make sure that your employer knows what is required of them by local, state, and federal law. This is especially true if they are failing to live up to some portion of those laws. You should also ask your company if they have any specific policies or benefits that they may be able to offer you as a part of returning to work as a mom.